Sell Surface Pro 3 i5 | How Much is My Surface Pro 3 i5 Worth? A used Surface Pro 3 i5 is worth from $155 to $235, based on the storage size and condition of the device. *Price subject to change. Quote in dropdown is final. Sell your Surface Pro 3 i5 for cash today! Sell your Surface Pro 3 i5 for top dollar at GreenBuyback. Select the information above in order to receive an accurate quote for the Surface Pro 3 i5 you want to sell. Click sell item if you agree with the price that is displayed. GreenBuyback pays cash for your old tablets, and laptops. When you sell your tablet, or laptop to GreenBuyback you will never have to pay to ship. GreenBuyback is dedicated to maximizing the cash back to our customers. 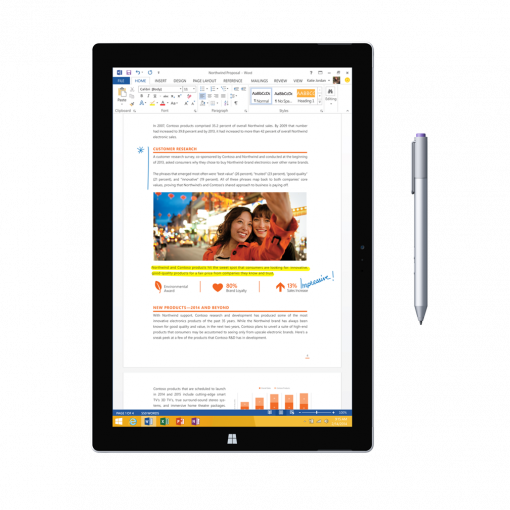 Debuting in October 2014, the Surface Pro 3 i5 beats out most small laptop options as your go to tools for work and play. The sleek design sports the best keyboard available on a tablet and the stylus pen is incredibly useful for note taking and sketching. The Surface’s battery life gives you a full workday’s worth of power. Selling a Surface Pro 3 i5 is so easy with GreenBuyback; send your Surface Pro 3 i5 to GreenBuyback with free shipping and you’ll get cash sent to you fast! Rated as one of the top tablets of it’s generation, the Surface Pro 3 i5 is good value and packs a powerful punch. Great for students, entrepreneurs on the go, and designers looking to check email and sketch out plans for a new project. GreenBuyback will buy your Surface Pro 3 i5 in any condition, even broken! Simply head to GreenBuyback to get a quote, send your Surface Pro 3 i5 in, and get cash quick!